Panna Cotta is a quick and easy dessert that is sure to impress. I have always loved the delicate taste of a good panna cotta. And now I have a dairy free version that I can feel good about feeding to my family. 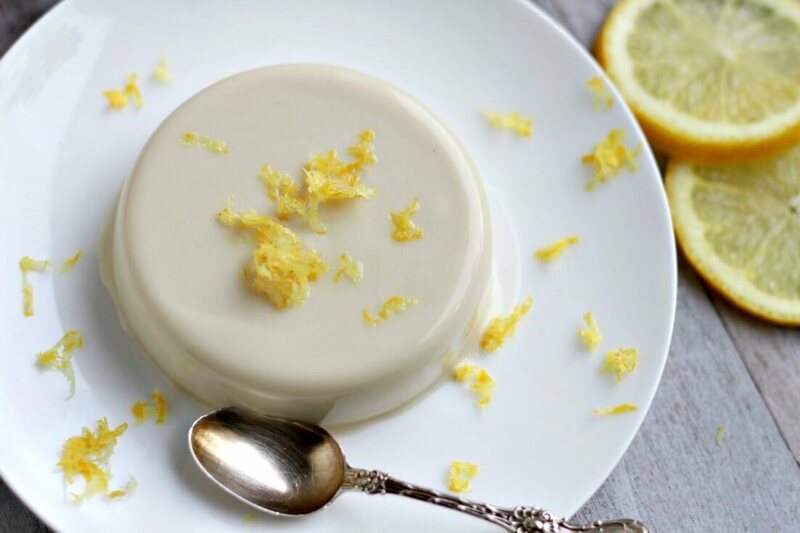 Today’s recipe: Lemon Panna Cotta. Sometimes the best things are the most simple. 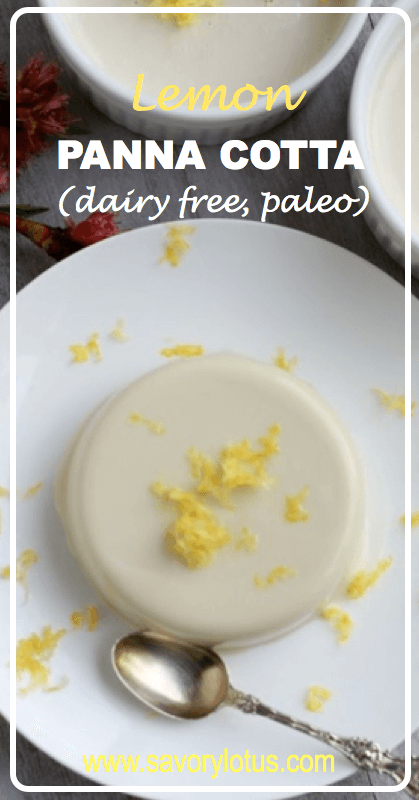 Making dairy free and paleo-friendly panna cotta is a breeze. It requires just a few minutes of prep. You do, however, have to plan a bit ahead as it does require at least 4 hours to set in the fridge. 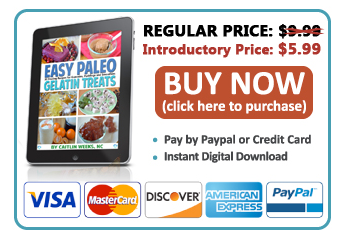 Loaded with good quality fat and grass fed gelatin (shown to improve skin, digestion, and bone/joint health,) this delicate dessert can be eaten for breakfast or dessert. Read more HERE about the health benefits of gelatin. 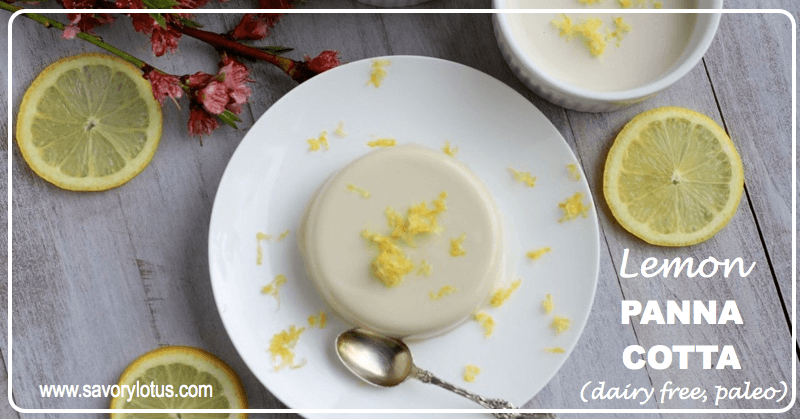 I have to admit that I have made this lemon panna cotta 3 times over the past week. 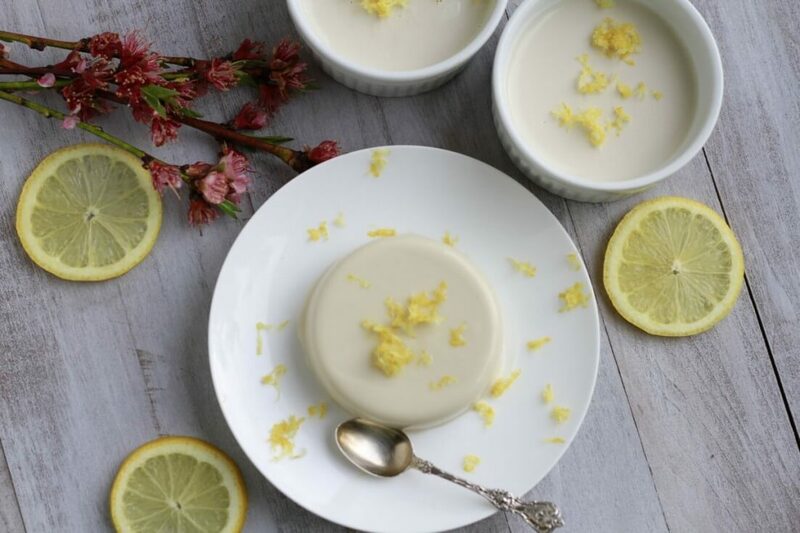 The creamy richness of the coconut milk pairs perfectly with the zesty lemon flavor. I’m always delighted when the panna cotta slides right out of the custard cups or ramekins so beautifully. It’s the simple things, right? I hope you enjoy it! And Happy Spring, everyone! Whisk together one cup of the canned coconut milk and lemon zest in a medium pan. Bring to just below a boil, turn off heat, cover, and allow to infuse. Pour the rest of the coconut milk into a shallow bowl and sprinkle the gelatin evenly over the surface and allow to BLOOM for 10 minutes. Once gelatin has bloomed, gently reheat the coconut milk/lemon mixture to just below a boil and whisk in the coconut milk/gelatin until completely dissolved. Turn off heat. Whisk in the sweetener of choice and vanilla. Run a sharp knife around the edge of each cup and unmold onto a serving plate, and garnish as desired OR you can place the chilled cups into a hot water bath for a minute or two to make removal a titch easier. 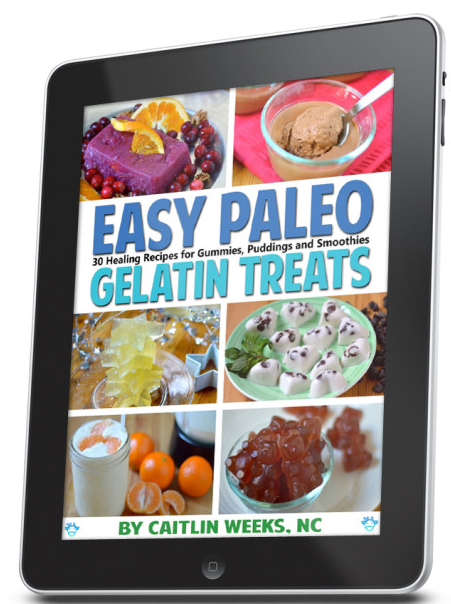 Need more gelatin recipe ideas? hi there! this looks delicious! i made a panna cotta for the first time a few months ago and it was amazing! we even had it for breakfast a few times with fresh berries. I stopped making it because I could not find a coconut milk that is organic/bpa free/ guar gum free. I even made my own coconut milk and tried to make the panna cotta with that, but it never gelled. are you concerned with the guar gum?? I usually always use this brand of BPA and additive free coconut milk—-> http://amzn.to/POF11Y I order it online by the case. I use ALOT of it. However, this recipe works better with a coconut milk that has an emulsifier. Not ideal but this is not something that I eat all of the time. I eat clean and healthy most of the time and a little guar gum isn’t going to get me. 😉 I just love this recipe so much. I do sometimes make it with the additive free coconut milk. It still works. It just separates a bit. Still tastes amazing. Thanks for stopping by. Curious does this taste like coconut at all or mainly lemon? It is does have a light coconut taste but mostly a creamy lemony taste. It’s subtle! I followed the recipe to a tee, but somehow mine just overwhelmingly tastes like honey. Is it supose to? hey (: i want to try this recepie, how many grams or ounces are in one cup coconut milk? i assume there are different kinds and i wonder which one you used? Hi, I was wondering if you’ve ever tried making the recipe vegan? Using Agar Agar and another sweetener. Do you have any experience with those and how much it should be in that case? Thanks! Just made it, was delicious. The full family loved it! And I had some cherry reduction adding to another level. Love it thanks a lot. Great for my next dinner party.